Remember back in May when we went on a trip to a ghost town and went panning for gold? It was a long time ago, right? 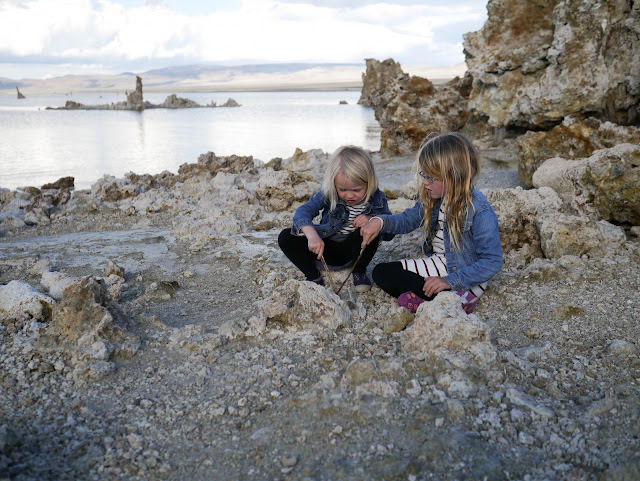 Well, we also spent some time checking out the amazing Mono Lake, but I got a little distracted with planning our Australia trip, then taking the Australia trip, and then having three kids at home all day, every day, so I never got around to sharing it with you. 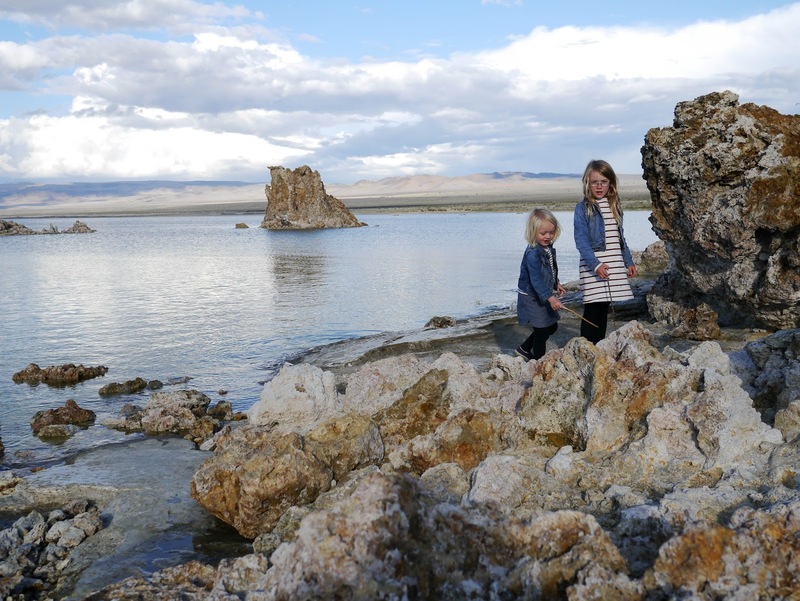 Back in May we visited Mono Lake after spending half the day at the nearby gold mining era ghost town of Bodie. 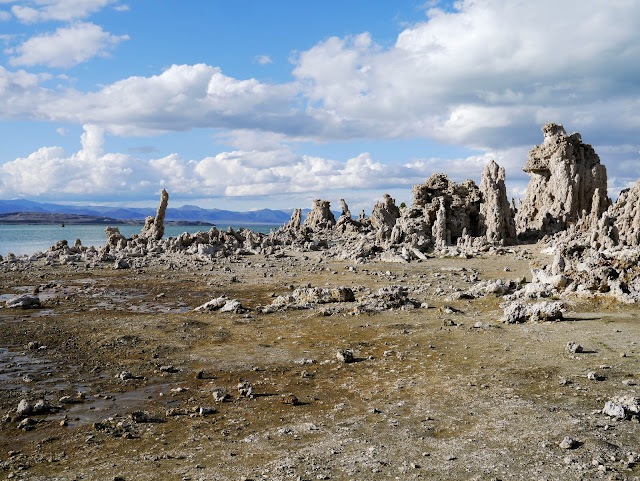 Mono Lake is famous for its amazing limestone tufa towers. 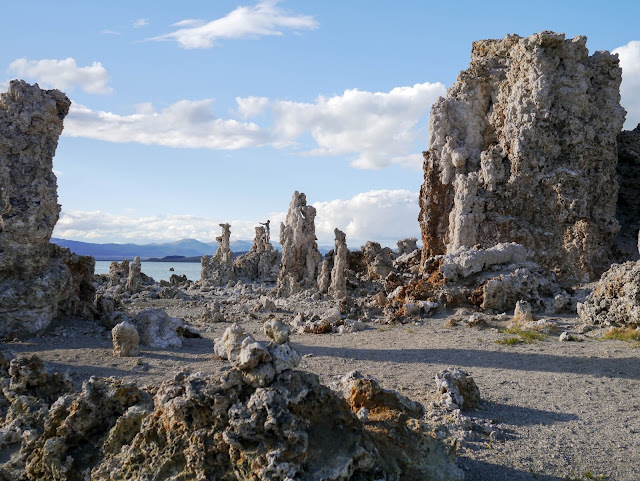 The tufa towers are calcium carbonate structures formed by underground fresh water springs welling up in Mono Lake's alkaline water. 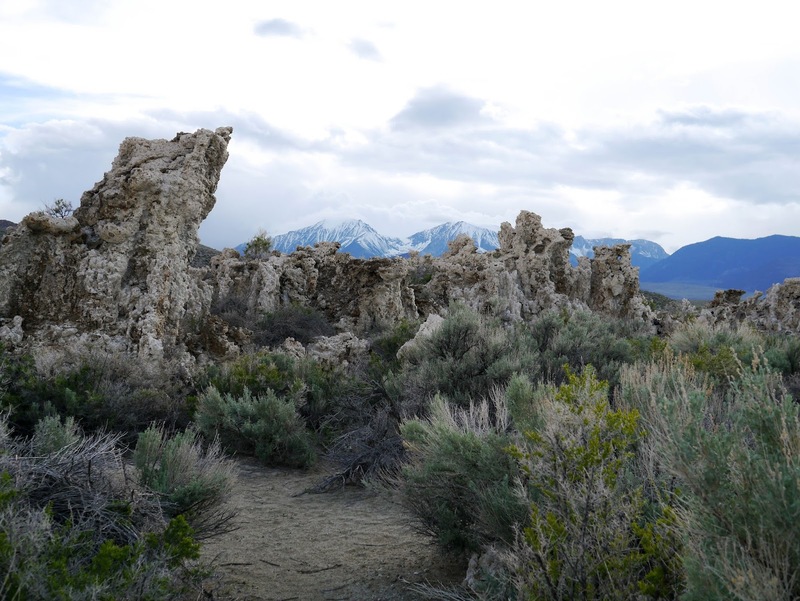 These tufas should be under water, however in 1941 the City of Los Angeles started diverting water from streams that feed Mono Lake. Over the years this caused Mono Lake to drop by 40 feet, exposing 17,000 acres of exposed lake bed. 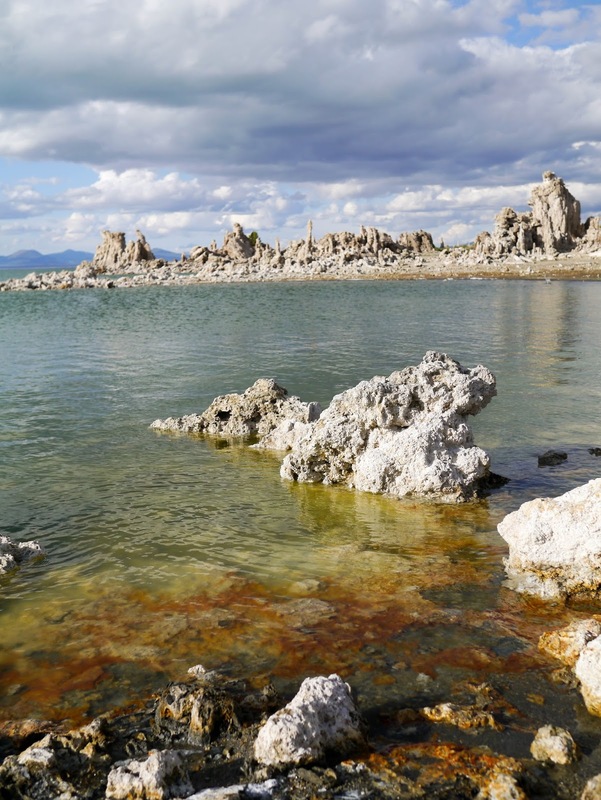 Since 1994 Mono Lake and its tributaries have been protected and the water level is slowly rising again. It had been kind of stormy as we approached Mono Lake. 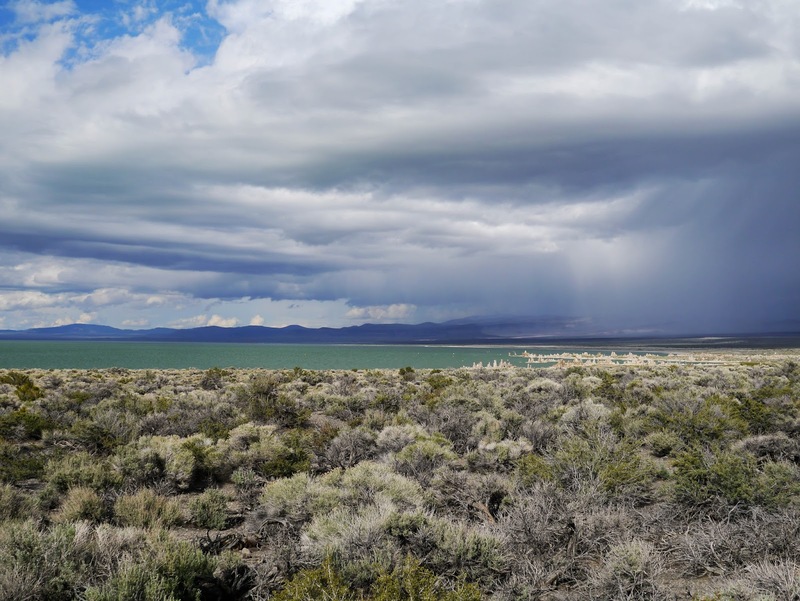 While it didn't rain where we were, we could see heavy rain falling over the lake in the distance. At one point there were lightening strikes over the lake as well. 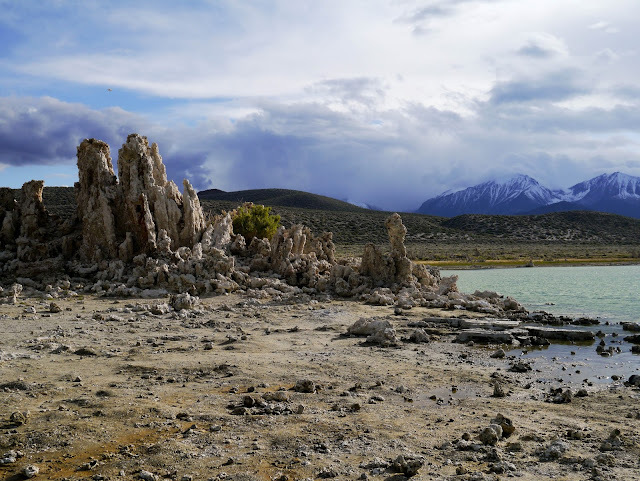 It was pretty amazing to see but luckily the rain didn't actually reach us. 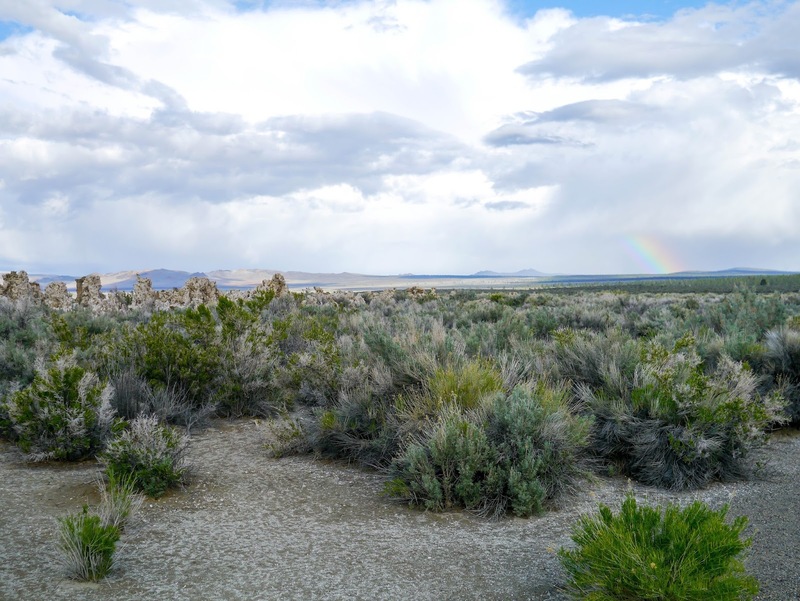 It did leave us with a lovely little rainbow when it cleared though. The tufa towers can be seen at various places along the lake shore, but the best place to see them up close is the South Tufa Area. We originally thought about giving this a miss and just viewing the tufa towers from afar when we first arrived as both Lola and Mathilde were fast asleep in the car. 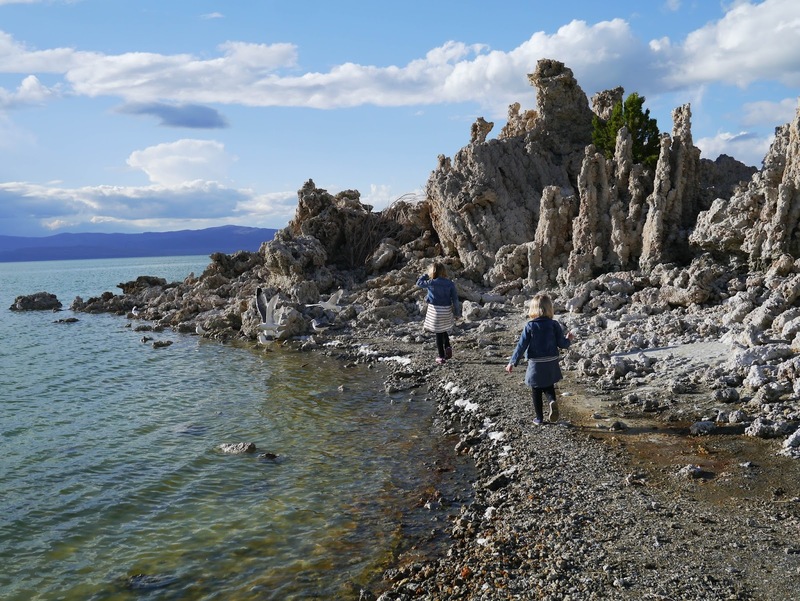 But as great as the views over the lake were from afar we realized we couldn't come all this way and not see the tufa towers up close. Getting a sleepy Lola out of the car and into the cool air took a lot of convincing (and maybe a bribe of ice cream for dessert!) 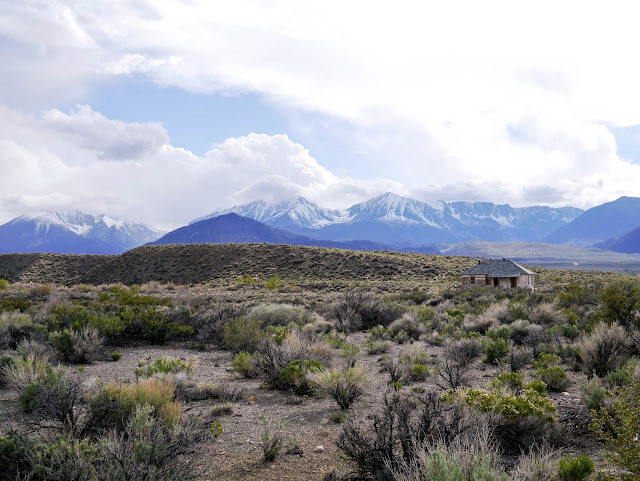 but we eventually got there. Once she reached the shore line and was able to play she was glad we woke her up. 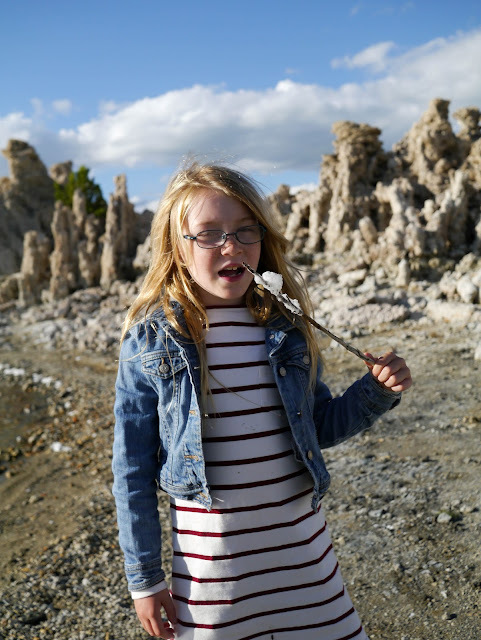 Ava and Lola found themselves a couple of sticks on the ground and used them to draw paths in the sand, to poke at rocks and to scoop up foam from the water's edge - which they then pretended was marshmallows they were roasting. Really gross, smelly marshmallows! 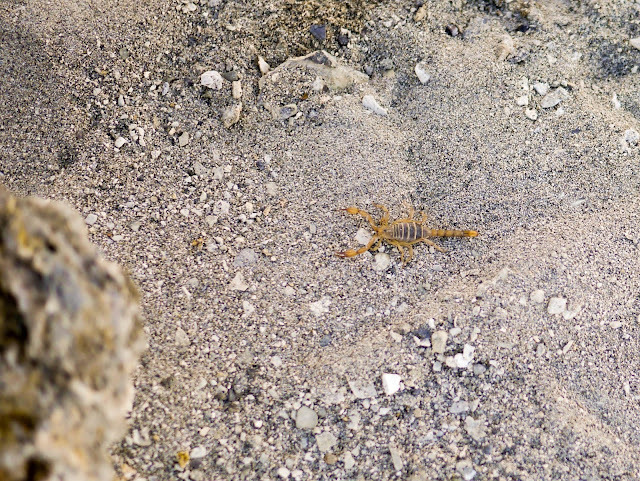 At one point their poking around with sticks uncovered a scorpion. We made sure to steer clear of him and carefully placed his rock back over him. Climbing the tufa towers is prohibited but you can bet that there were people climbing on them anyway. 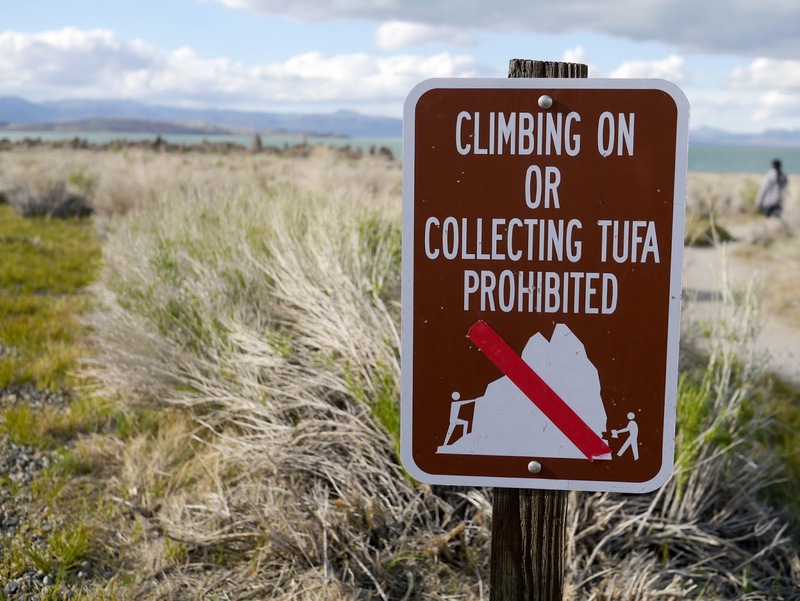 There's a guy half way up a tufa tower taking selfies in the second photo below. Can you spot him? Ava and Lola were would've loved to have been able to climb the tufa towers but as they knew that it wasn't allowed they didn't dare try. The scenery around Mono Lake is pretty spectacular too. 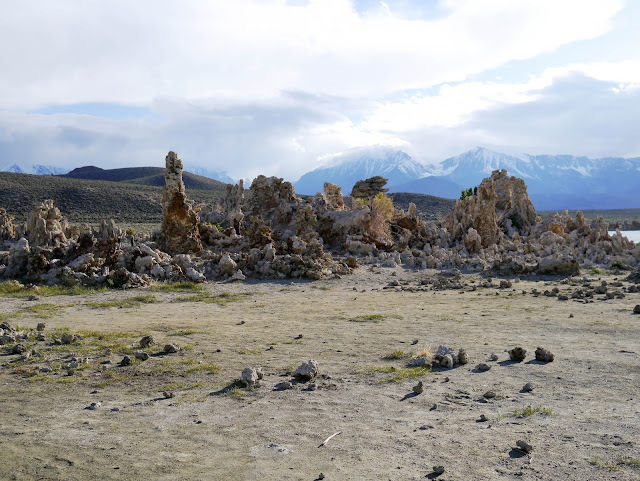 The dried lake bed landscape contrasts starkly with the snowy mountains a relatively short distance away. 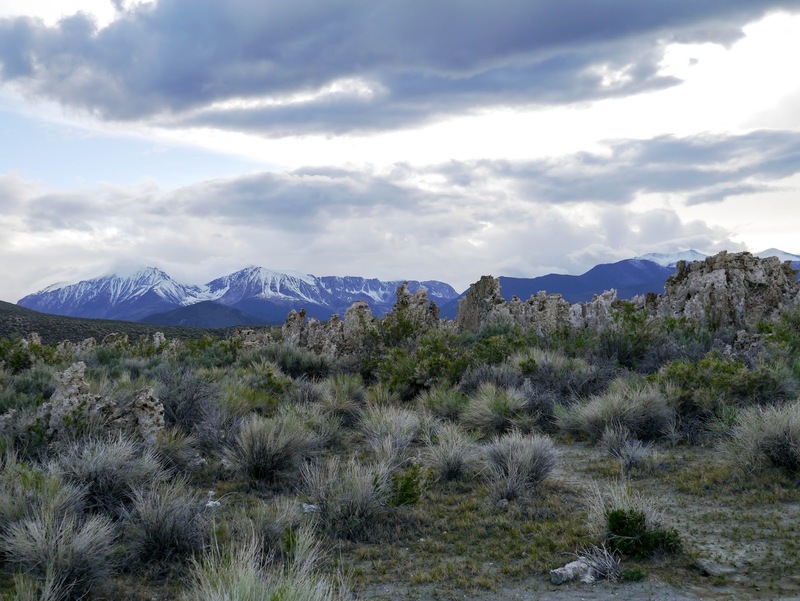 It's such a ruggedly stunning spot. 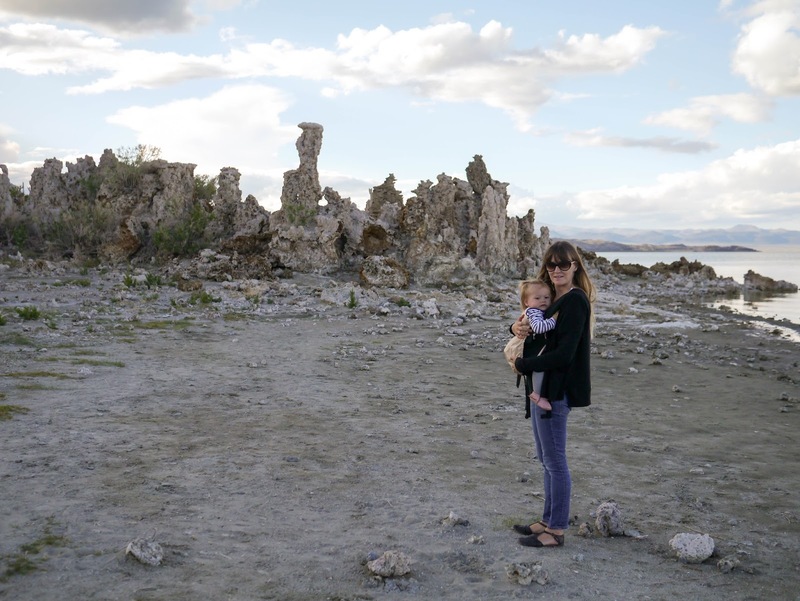 Mathilde had been asleep for most of our time at Mono Lake but she woke up just as we were about to leave so we managed to squeeze in one photo of her awake. 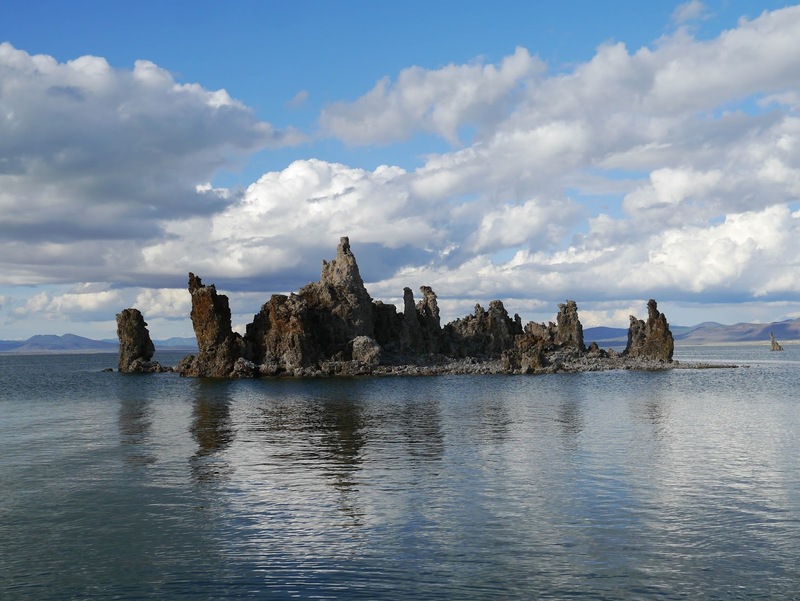 Mono Lake is an amazing place to visit. We arrived towards the later end of the afternoon and it was getting cold and dark by the time we left. If we'd had a whole day to spend at Mono Lake we would've checked out a few other spots and done a little hiking. Maybe next time. 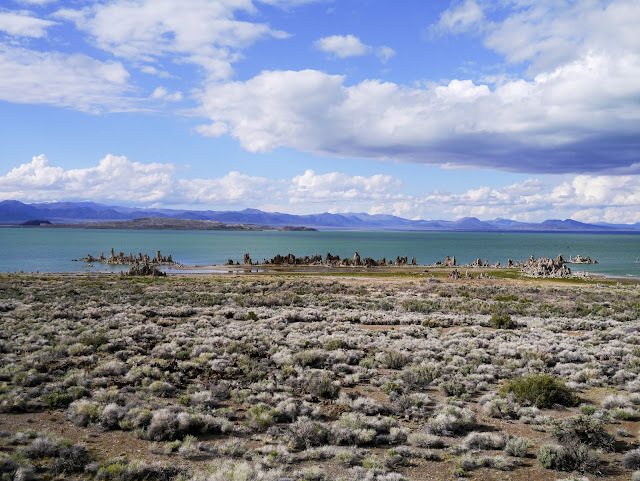 For more information about Mono Lake visit California State Parks here.